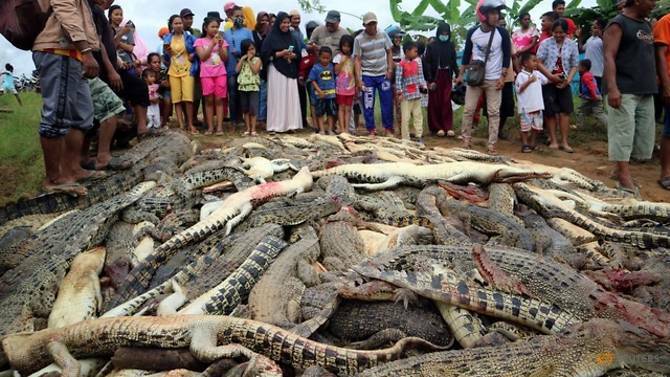 An angry mob has slaughtered nearly 300 crocodiles in Indonesia after a local man was killed by one of the reptiles, authorities said Monday. The revenge killing happened on Saturday (Jul 14) in Papua province following the funeral of the man, who was killed after he fell into an enclosure at a crocodile farm while looking for grass to feed his livestock, police and conservation officials said. But the mob, which numbered in the "hundreds", was not satisfied and headed to the crocodile farm armed with knives, machetes and shovels which they used to slaughter 292 crocs, from four-inch-long babies to two-metre adults, authorities said.